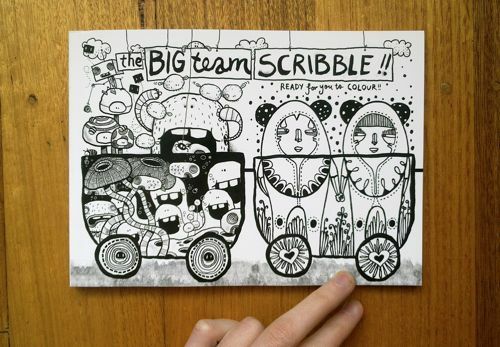 BIG TEAM SCRIBBLE: Peek inside our BIG TEAM SCRIBBLE colouring book! 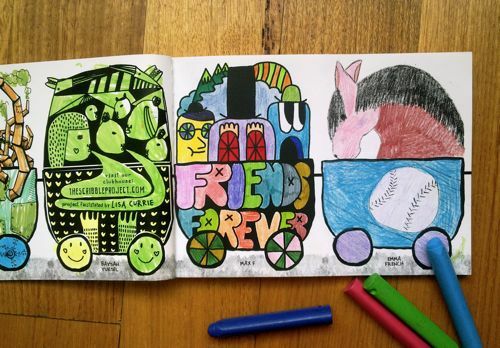 Peek inside our BIG TEAM SCRIBBLE colouring book! 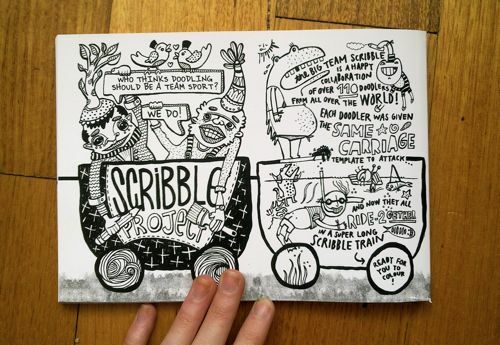 The Big Team Scribble colouring book is a collaboration of over 132 scribblers from all around the world. It started with a simple carriage template for everyone to load up with their own scribbles, then I strung all the carriages together for one awesome (and really, really long) scribble choo-choo! Fancy yourself a copy? The colouring books are now sold out sorry. In 2009/10 over two hundred scribblers from all around the world collaborated on a BIG TEAM TOTEM and then an even bigger TEAM TRAIN. BIG thanks to every scribbler who got busy with their pencils! Curated by Lisa Currie -- pop over to The Scribble Project and my blog.